If you only have one day in Freiburg, of course you want to make the most of it! Let The Travel Tester guide you to some of the highlights of this city. As part of the #JoinGermanTradition campaign, I visited the Baden-Württemberg region in the South-West of Germany and wrote this guide to one day in Freiburg. Where to Have Lunch in Freiburg? Where to Have Dinner in Freiburg? Arriving with the airport bus, I get off at the bus terminal and walk in just five minutes to my hotel, the charming Park Hotel Post, where I drop my bags and am greeted by my guide Etti. She will introduce me to her city with a guided tour to do some Freiburg sightseeing. Usually, I’m all fine exploring on my own and discovering a city myself, but soon enough I realize that Freiburg is so full of history and little unknown details, that having a guide explain and take me around town adds a huge value to my visit. From the hotel entrance, we simply take a left and walk straight into the city center. Because that’s how easy navigating Freiburg is, really. In a matter of minutes right from the train or bus, you’ll step onto the cute cobblestone streets and can soak up some great atmosphere. Or, what I always do as soon as I arrive somewhere: LOOK UP. Freiburg’s old center is full of amazing historical architecture and it’s hard to not take a million photos of all the details of the bright coloured houses, restaurants and shops. But you have to be careful, though. Freiburg is lined with ‘bächle’, long open gutters with streaming clean water. Just about twisted-ankle deep. Etti told me that there is a saying that if you catch a wet foot in Freiburg, you’ll have to marry a local, so be extra aware, haha. The kids don’t seem to mind them though, because on this sunny day (Freiburg is supposedly the most sunny place in Germany), they splash around in the bächle quite happily. And best of all: they tow little wooden boats behind them on a cord. You can buy them everywhere from street vendors. A little while later, we pass these two lovely girls who take a break from shopping with their feet dipped in the water. We should have these in all cities! There are many little boutiques and stalls in the center, so if you like shopping, you’re at the right place! The second thing you’ll probably notice walking around town, is the beautiful pavement patterns in front of the entrance of most shops, houses and café’s. Cut out of round stones, these designs mark the type of person or business you can find inside. Can you guess what the following are? I was told he wasn’t supposed to touch anyone, so he had to wear gloves every day. And not even his wife was allowed to hand over her money directly to a shop keeper, she had to lay it down first for them to pick up. Living in superstitious times must have been fun, right? If you’re a lover of architecture, you’ll have a great time in Freiburg. Because the city has been occupied by the Austrians, the French, the Swedish, the Spanish, and various German states, you can find influences from all over the place. In World War II, much of the city, except the main cathedral (a real God’s wonder) was destroyed, but after the war, the city was rebuilt following the original Medieval plan. The new town hall served many years as a university and administration building before it was used as town hall. A glockenspiel tower bells chimes daily at 12 o’clock from the turrets of the new mid section. At the Rathausplatz, you used to find a huge monastery on the site, but nowadays there is a nice open square where you can sit and have a drink, or stroll the little market. The St. Martin church is still there and its interior, that got destroyed in WWII like most buildings in Freiburg, got restored to their original form afterwards. It’s hard to miss this red building with its heavily decorated, late Gothic doorway in the Franziskanergasse. For two years, a famous person most people from The Netherlands would know has lived here: Desiderius Erasmus, a Rotterdam born humanist, committed to reforming the Catholic Church in the 15th century. One of the images on the facade is quite interesting: the lady on the top right is shown with a goitre on her throat, caused by iodine deficiency. This was something that was very common in the Middle Ages, apparently especially in the Black Forest region. Another interesting fact is that Erasmus, although choosing this house himself, was always quite annoyed with the church bells and even tried to request that they’d be turned down a bit. Of course, they didn’t approve his request, unfortunately for him. If you can, pay a quick visit to the new Library of the University of Freiburg, by Degelo Architekten. It’s not quite finished, but already has sparked quite a bit of controversy. The locals feel the building is too big and too dark to really fit in with the old neighbourhood it’s in and I have to agree with them on this. For more than $66 million, I’m sure they could’ve come up with something a bit less intrusive. The main focus point of the city is the massive cathedral and even though it’s currently under construction, you can see why: the open-worked pyramids of the tower are incredible (and probably the reason it still stands after all the bombings in the war). Interesting to hear was that the church was build in about 130 years, which is incredibly fast in that time, normally this would take many centuries! Also to see the glass windows have survived all the turmoil is amazing, right? Etti shows me some curious markings on the outside wall of the cathedral. This is the place where the people from the market went if they had a problem with the size of their bought goods. For example, here is where they measured their bread (left good harvest, right not such a good harvest). There are also markings for grain and wood around the corner, towards the entrance of the church. The Augustiner Museum at the Augustiner Platz is definitely a Freiburg must see. We have a refreshing drink in the café of the museum and I decide that this is cultural enough for me (it’s boiling hot outside! I need sun! ), although I’ve been told the museum is well worth a visit. I also didn’t visit the Museum of Archaeology, located on the Colombiastrasse/Rosastrasse. It has a beautiful garden around it too, great to hang out in on a hot day like today. Another place you cannot really miss is the daily market at the Münsterplatz, just under the great cathedral. You can find anything from flowers to handicrafts… and of course local food. I tried the ‘Lange Rote’ (‘Long Red One’), a great sausage on a bun with some onions, mustard and ketchup. Very tasty, definitely add this tasting to your Freiburg to do list! All afternoons are best spend relaxed with a drink and a good view, right? That’s why I thought, so I walked over to the city garden (you get there by a big foot bridge), and I took the ‘Schlossberg Bahn’ up the hill, one of the more popular Freiburg tourist attractions. After a fun little ride in the cable cart, I was treated to the best view over the city from the restaurant right next to the lift. After baking in the sun for a little bit, I made my way down by the lift again (if you’re not as lazy as me, you could also just walk) and went back to the Augustinerplatz to visit the famous ‘Feierling’ Brewery that everyone’s been recommending me. With a huge beergarden that was filled to every last seat (can’t blame them with this weather), I went into the main building and took a seat next to the open window. The girls working in the brewery were just too friendly to be true (almost, I’m used to big city-unfriendliness, I guess), and let me taste the homemade beer with a fat Brezel (only realized the other day that the word ‘Pretzel’ is only used by Americans). Not bad at all! (And I’m not really a beer drinker normally) Then it was on to the delicious local meat with ‘spätzle’ (a type of noodle) which I’d never had before and I couldn’t even think of desert after that, so full and sleepy I felt. Freiburg in Germany is a lovely town with a lot of character and charm. Besides a nice day out, Freiburg is also a great place to start exploring the Black Forest region, which I’ll be doing next with you. So stay tuned and #JoinGermanTradition as we dive deep into the culture of South Germany with some (tasty) surprises along the way! 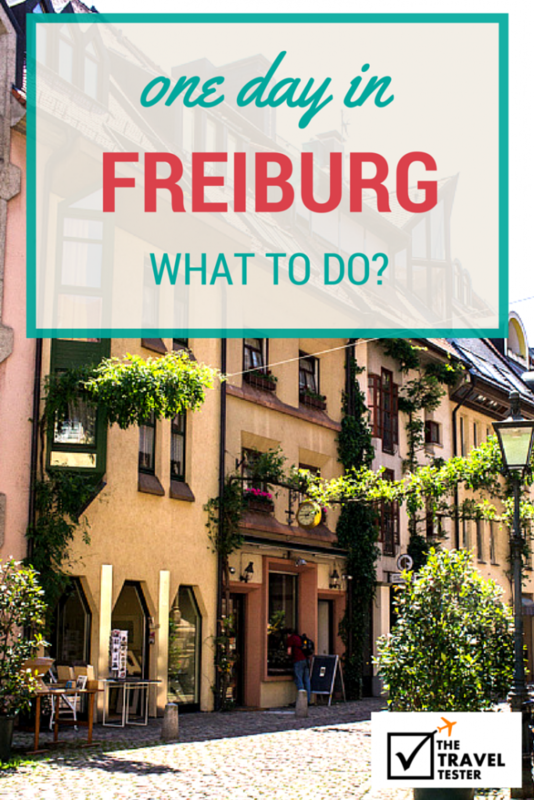 I hope this gives you a good overview of what to do in Freiburg! Have you ever visited? Or would you perhaps after reading this post? What would attract you in this city? Arriving at the airport, take the exit to France/Germany. Wait at the bus stop direct in front of the terminal building. It leaves once per hour, costs €26,00 (single) or €42,00 (return – both tickets only available by the coach driver, payable in cash, there is an ATM in the terminal) and takes about 1,5h to the train/bus terminal of Freiburg. It was a first for me to arrive at an Airport which was located in 3 countries simultaneously! Freiburg Activity Suggestion: Going up the Schlossberg with the Schlossberg Bahn was a lot of fun! It’s 5 Euros return for an adult. Disclaimer: I was invited to visit Freiburg by the German Tourism Office as part of the #JoinGermanTradition Blog Trip in June 2015, created and executed by iambassador in cooperation with the Dutch office of the German Tourism Authority. All photos and experiences in this post are, like always, 100% my own. One Day in Berlin, Germany? Complete Guide To A Perfect City Break! Freiberg looks amazing! The mix of historical and colorful architecture is incredible and a reason enough for me to want to visit. I enjoyed learning about this place that is in 3 different countries and has influence from so many parts of Europe. Thanks Brooke, totally agree! I loved the architecture as well, I couldn’t stop looking up all the time :) I wish I had a bit more time to also explore out of the historical center, I’m sure there is so much more to discover here. Incredible blog! I’m visiting Freiburg in about a month and your blog is my favorite so far. You took beautiful photos and I hope to see everything you saw. I cannot wait!